Breakfast for dinner is a perfect already stocked meal. 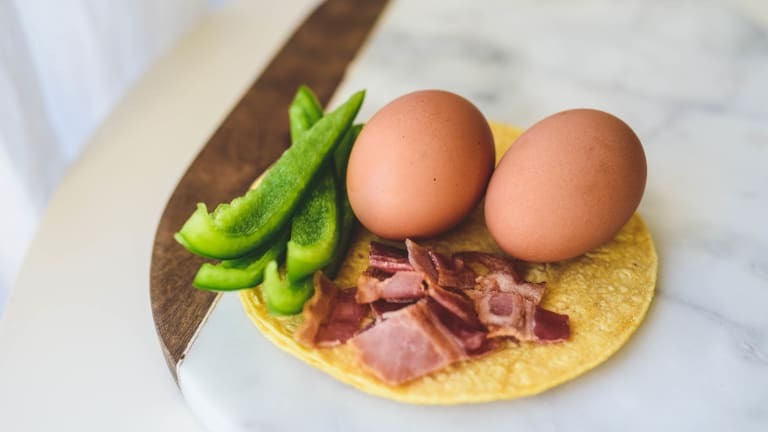 I almost always have eggs and tortillas around and all the other toppings can come from whatever you have in your fridge. I will offer suggestions, but feel free to add whatever you’d like. Paleo: Use this tortilla recipe; omit milk, cheese, and sour cream; use ghee instead of butter. Gluten-free: Use a gluten-free wrap or tortilla, or enjoy as deconstructed burritos without tortillas. Vegetarian: Use mushrooms or other vegetable instead of bacon. 1. Whisk together eggs and 3 Tbsp milk. 2. To a medium skillet, add bacon, green pepper, and onion. Cook over medium heat until bacon is crisp and the green pepper and onion are tender. 3. While the bacon mixture is cooking, heat another medium skillet over medium heat. Add butter to the pan. When the butter is melted, add the eggs and salt and pepper (to taste) and scramble. 4. To assemble breakfast burritos, top each tortilla with eggs, bacon mixture, cheese, salsa, and sour cream.